We know how much you need a profitable betting system that is very effective and that can earn you piles of cash. 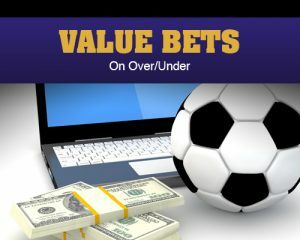 With a large number of football bettors looking for more profitable markets than 1X2, where a lack of scoring or a late equaliser can turn even the best betting judgments into losing bets, here’s a simple guide on how to beat the bookies, finding value bets in the Over/Under goals markets. Here’s a simple guide on how to calculate the probabilities of expected number of goals for a match and how to convert them into odds, so that you know what odds to bet your money on and what odds to avoid. The first step is to find the average number of goals per game, which can depend on the league. This is an easy statistical figure to find online, to give you a better idea about differences in the average goals per game across the major European leagues, premier league matches have an average of 2.4, Italy’s serie A whopping 3.21 and Spain’s La Liga 2.85 goals per game. The random nature of goal scoring is the reason that allows statistics to follow a poison distribution as a simple predictive model for over/under betting. You must first determine the correct scores that will lead to a winning under 2.5 bet (0-0, 1-0, 0-1. 1-1), find the respective probabilities for each team from the above table and then calculate the probabilities of each score by multiplying. Betting is best profitable if you treat it as a business and investment, rather than gambling away your money and banking on luck.